A stylish looking and superb tasting handcrafted Rhubard and Giinger Gin. 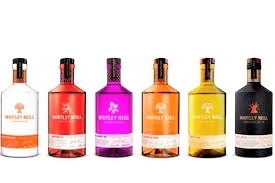 A Gin of exceptional quality where the essence of rhubarb adds a tart crisp edge to a smooth English Gin base. The ginger extract warms the palate for a full-bodied finish. A bottle of personalised Gin is a wonderful way to send your special message and makes a unique, tasteful and thoughtful gift. Our unique label creation system's ease of use allows everyone to bring out their creative side and really enjoy creating their special gift. It has a wonderful selection of personalised labels to choose from, and you simply add your message, image or company logo to create the most unique and memorable of gifts. Simply choose any o four Champagne labaels and your label will be adapted accordingly to reflect Gin. We wish for all our gifts to be a pleasure to send and a delight to receive so we present your personalised Gin with a beautiful hand-tied bow to finish off this stunning gift.